Rhino Wrap is a laminate of aluminium foil and polywoven fabric which is wrapped around the wall frame to provide the building with a protective barrier against wind, rain and heat transfer. The lamination process is achieved by use of a fire retardant adhesive. Rhino Roofing, which is fixed under the roof covering, may include an additional layer of insulation base paper for added rigidity. 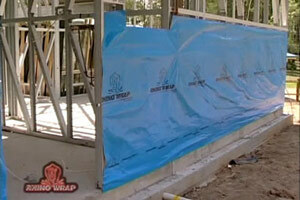 Rhino Wrap and Rhino Roofing are pliable building membranes with low flammability. The non-reflective polywoven fabric eliminates glare during the installation process and provides increased strength to prevent tearing prior to the installation of wall or roof cladding. The reflective aluminium foil reduces heat transfer across insulation membranes. Rhino Wrap and Rhino Roofing reduce summer heat gain and winter heat loss in a building. This enhances energy efficiency and in so doing helps to reduce greenhouse gas emissions.